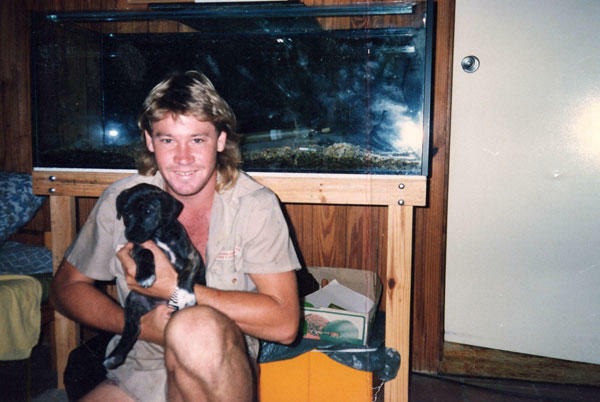 Steve Irwin holding a lizard for one of his documentary shoots. You can see he has passion for the animal by his expression. I agree. We all miss you Steve. I liked the fact that you as a celbrity owned Sui who was a Pit-bull. I hope you're having fun with her in Heavan. Sui is sooooooooooooooooooooooooooooooooooooooooooooooooo cute! R.I.P mates. i luv both of you. RIP my hero and idol. Im doing a project about a famous Australian and im doing it about you. I will miss your smile so much. I hope your having fun in heaven with Sui! R.I.P steve! For school im doing a project and your the person im doing it in! You where my hero. Everyone knew you as the \"crocidile hunter\" But to me you where more then that,You where a hero who loved his FRiends and family and you will be dearly missed. R.I.P in piece steve! For school im doing a project and your the person im doing it in! You where my hero. Everyone knew you as the \"crocidile hunter\" But to me you where more then that,You qwhere a hero who loved his rfiends and family and you will be dearly missed. RIP MY HERO.I WILL NEVER FORGET YOU.GOOD BYE MY FRIEND. Sui was such a good hand for Steve. I cried my eyes out when Sui died. I lost my dog and I knew how everyone felt. I don't even know what to say about this picture, its just so beautiful. I'm so sorry for your loss Terri,Bindi, Bob, and little Bob. Your in my thoughts and prayers. I am a rescue stop for German Shepherds.One of my rescues died the day I buried my wife. They were inseperable. Coincidence?? I think not. My wife becokned from Heaven ..Angel went to be with her. GOD makes dogs, folks! Awwwww Sui.....what a dog...you could see how much Steve loved you and even i cried when you died. awww....what a cute pic, and i'm sure steve and sui are having a good time in heaven. all my thoughts and prays are with terri, bob, bindi, and baby bob. This picture represents the beginning of a Wildlife Icon. Who could ever imagine that he would become such a beloved figure through out the world. Good on you Mate. RIP with Sue. Zach, Los Angeles, CA, U.S.A.
looking at this picture brings tears to my eyes because it was the begining of Steve's greatest bond with a fourlegged friend. It was a great run for the both of them and now they are having a blast in heaven, together once again for all eternity. I fell that Steve wonted to be with sui. I'm sure they're having a grand old time together in Heaven. Even know I didn�t knew you Steve I still loved you, you were a good man, and a big man.. I love this picture, and knowing that Steve is now reunited with Sui...RIP Steve. We feel like we have lost a family member. Our thoughts are with Bob, Terri,Bindi and baby Bob.